A major highlight on the social calendar, the annual Playing for Pink Ladies Invitational Polo 2018 is taking place on Saturday, October 27 and promises to be a combination of flair and fundraising. Hosted for the fourth consecutive year at the prestigious Inanda Club in Sandton, Johannesburg, the day is set to surprise and delight guests with incredible entertainment, gourmet food, high-fashion, pampering, luxury shopping, and sportsmanship, all set against the backdrop of an energetic polo match. This year’s theme ‘Pink Fire’ is all about flair, flames and some of South Africa’s A-listers, influencers, sports personalities and all-round fashion enthusiasts painting the Inanda grounds in hues of electrifying pink. Presented by Edith Venter Promotions, Playing for Pink Ladies Invitational Polo 2018 takes place during Breast Cancer Awareness Month. The campaign seeks to raise awareness and funds for Reach for Recovery, a non-profit organisation facilitating the support and care of newly diagnosed breast cancer patients, those currently undergoing treatment, as well as those in remission. “Reach for Recovery is a comprehensive non-medical programme created to help women with breast cancer. It is based on the premise that former breast cancer patients, now physically and emotionally healthy, can relate in a unique and positive way to newly diagnosed patients,” says CEO of Edith Venter Promotions Edith Venter. The not-for-profit initiative’s Ditto Project will also benefit from the day’s proceedings and is aimed at helping women from lower income groups, who cannot afford to undergo reconstructive surgery, to be fitted with an external breast prosthesis to regain their confidence and dignity after diagnosis and surgery. “Playing for Pink Ladies Invitational Polo is in its fourth tenure and we, as black® are proud to be associated with an initiative whose mandate is to raise funds and create awareness for breast cancer in support of Breast Cancer Month. As a new entertainment brand, we are constantly looking for meaningful ways of giving back to our community and this initiative is another way of showcasing our support. With the funds raised this year, we hope to make a difference in the lives of women in cancer remission and to help them rediscover themselves,” comments Surie Ramasary, Chief Executive of black®. So mark your calendar now for a day you don’t want to miss. On arrival guests will be welcomed with a refreshing cocktail. A decadent high tea will be served with all the trimmings, boasting flavours that cater to all palates, and complemented by the finest Champagne. Retail therapy and luxury shopping are the order of the day in the form of upmarket pop-up stores. Guests can also relax and enjoy a pampering session at the salon with hair, make-up and nails sponsored by international brands Clarins and SOHO. Thereafter the polo will commence, followed by a fashion show and special performances and spectacular shows by talented South African artists. The event intends to be a day of glamour and goodwill that will touch, and make a difference, in the lives of many. 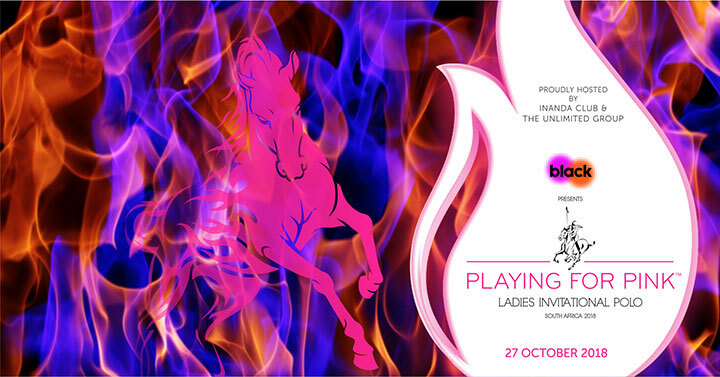 The public is encouraged to purchase their admission to the ‘Fire Galleria’ at the Playing for Pink Ladies Invitational Polo 2018 for R800 from [email protected] or on Facebook: @PlayingforPinkSA. Book your hospitality suite at this truly prestigious occasion via email: [email protected] or contact Edith Venter Promotions on 011 783 5887.